Digital Greens is one of the commercial projects of Emaar MGF Group. Emaar MGF introduced an international standard and contemporary styling designs to the buildings that have uplifted the surrounding existing residential areas. This commercial complex understands the basic criterion necessary for well-developed luxurious office infrastructures by boosting the interiors with a combination of facilities and comprehensive interior spaces. 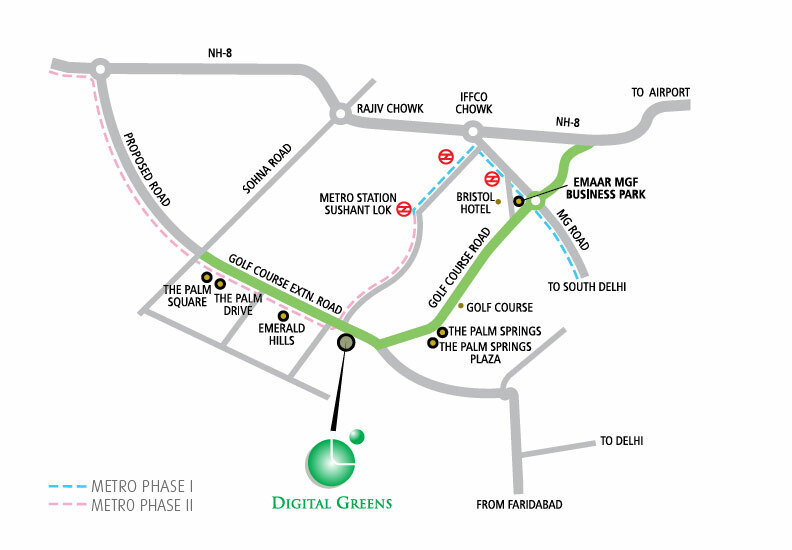 Emaar Digital Greens Sector 61 Gurgaon project is definitely equipped with some delighting and fulfilling amenities along with considerate security measures to maintain an international level of excellence for the Digital Greens quality space meant for a business to thrive. Subsisting development of the project, that provides water, energy conservation and a healthy atmosphere to business. Used non-toxic paints, fly-ash bricks, and environmentally sensitive materials were used during the construction. The operating costs are low and the project procures efficient building management. The project contains a spacious and exquisite lobby along with public spaces. Healthy and safe environment for building occupants. Well organised, adequate parking spaces at ground and basement levels and a separate multi-level car park. An environment with cutting-edge technology, state-of-the-art architecture and world-class facilities. Spacious parking spaces on the ground and levels of basements for different parking needs. Power backup with high-speed elevators along with high-security measures. Located on the Golf Course Extension Road with an easy access to the Sohna Road, NH8. Situated with an integrated delighting neighbourhood with hospitals, schools, residential complexes, retail medicinal shops and some enthusiastic recreational ambiences. close proximity to the proposed Metro Corridor. Emaar Digital Greens commercial project is a subtle and complex commercial project that has a 2-tower infrastructure. The project area estimates around of 19.74 acres that are meant for fulfilling all of commercial buildings configurations. The project has been designed as per LEED guidelines which means it is considered amongst the green buildings as since its construction is healthy and safe for the environment as the construction materials were eco-friendly. Enjoy the integrated architecture that promises world-class facilities to each developing business.